São Jorge Island. What Makes it The Best Of The Azores? Is São Jorge Island The Best Of The Azores? Quite Possibly! When I’m feeling stressed and long to retreat from the world for a while, the place my mind transports me to São Jorge island in the Azores. I’ll admit, I haven’t been to all of the Azores islands yet so there is a chance that São Jorge’s position as my favourite may be usurped in the future. For now, let me share what makes it so special to me and suggestions for where to stay. As on other Azorean islands, the south side of São Jorge is more populated and the landscape divided up into flower-rimmed fields. 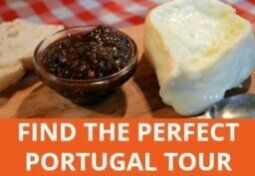 São Jorge cheese is as close to Cheddar cheese as you’ll find in Portugal and the Azores supply much of the mainland’s dairy products. Unsurprisingly, there are lots of cows and trucks transporting milk churns from small producers to central dairies for processing. While all this is pleasant enough, my heart lies in the north, where cliffs are often too steep to farm and foliage runs rampant. Waterfalls, lagoons and wildlife rule here. By far the most enjoyable walk we did in the Azores was the PR1 trail. It begins with a descent through hydrangea-splattered hillsides and continues through a patch of woodland to a crater lagoon on the edge of the ocean. A natural ridge of volcanic rock protects the water inside, making it warm, calm and perfect for swimming. There is a tiny village here, and a surf school if you’re that way inclined. Backed by a jungly escarpment and almost totally isolated from ‘civilisation’, this is the happy place my mind brings me back to. If I close my eyes, I can almost hear the birds chattering and squawking, the occasional splash of fish jumping and the gentle rustle of waves beyond the lagoon. 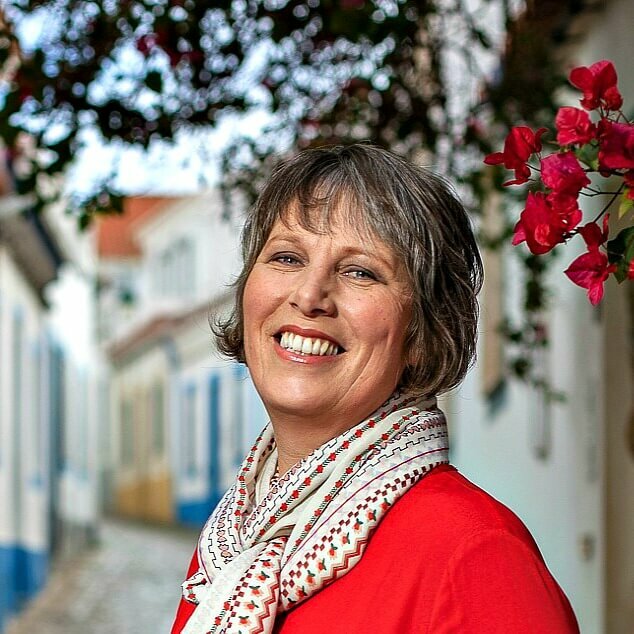 After a refreshing swim and picnic lunch, Dori and I set off again along the dirt road that connects the car-free Caldeira with Fajã dos Cubres, voted Portugal’s best seaside village in 2017. We passed ruined and restored cottages hewn from volcanic rock, one with fish hung in the doorway to dry. We were soon joined by a man who used to live there who explained that prior to the 1980 earthquake that devastated the settlement, around 200 people lived in the village. Back in those days, in order to attend school or go to market, villagers had to walk up the mountain Dori and I had just zig-zagged down. While we thoroughly enjoyed the views going down, I don’t envy them the upward journey one bit. Especially not laden with school books or groceries. 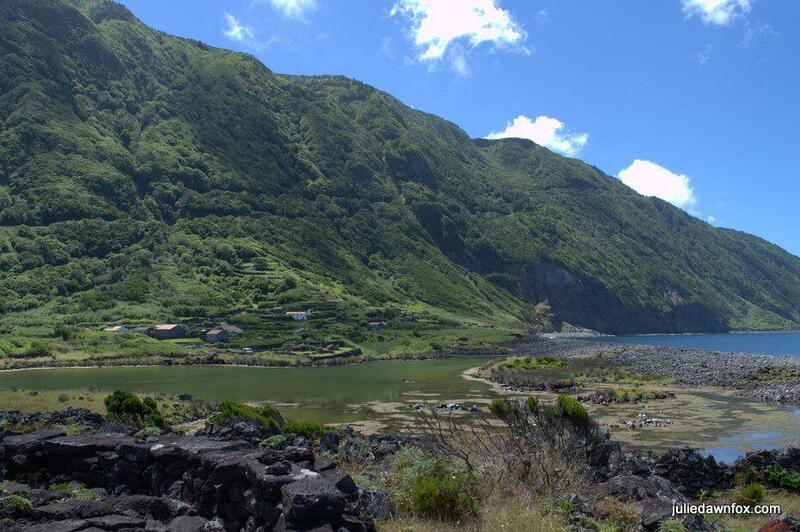 Fajã dos Cubres is now a peaceful nature reserve full of terns with wooden walkways that allow you to walk across to the ruined circular buildings. From here, the views of the cliffs and the green-tinged, slightly sulphorous lagoons is glorious. Our taxi driver (more about that in Practicalities) was already waiting for us when we arrived in the village but happy to wait while we stopped for an ice-cold beer. 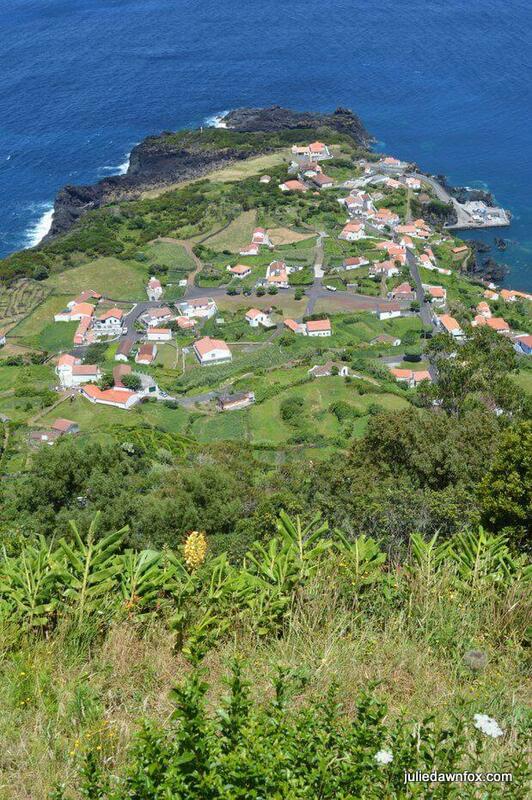 This walk starts high up in the mountainous spine of São Jorge island and climbs steadily to the highest point, Pico da Esperança, before heading down to a village with natural swimming pools. It promised spectacular views from the peaks and, since it was largely downhill, didn’t look too difficult. It turned out to be quite a challenge in more ways than one. The first obstacle was the weather. By the time we got dropped off at the start of the walk, the mist hanging over the mountain tops was so thick we could barely see 5 metres in front of us. While our taxi disappear into the cloud we shivered in our shorts and factor 50 sun cream, woefully unprepared for the cool temperature. Optimistic that the mist would soon burn off, we began the walk. Buffeted by blasts of grit-filled wind and learning from the cows that it’s easier to walk on the grassy verges than the gravelly track, the only bright spots were the occasional wafts of mint that we had crushed underfoot and an all too brief glimpse of the dramatic scenery we were missing. 9 km later, the relief we felt upon seeing blue sky and greenery stretching out in front of us was enormous. Behind us, a thick layer of cloud loomed but we had made it to the sheltered slopes and the warmth of the sun. Looking back at the mountains, they did indeed look spectacular, as did our immediate surroundings. Although both of us were wearing walking shoes and Dori even had a pole, we both found the loose pebbles on the steep track to be treacherously slippery and it took a great deal of effort to stay upright. I have never been so pleased to see tarmac as I was when we got near the Miradouro overlooking Fajã do Ouvidor. With the end tantalisingly in sight and the promise of a swim, we cut down a forested path towards the village. It was possibly the hardest kilometre I have ever walked. Steep, slippery and littered with uneven stones, we had to negotiate every step with caution. By the time we reached Café O Almica, it took four mini beers each for us to be able to speak to each other. Sagres has never tasted so good. 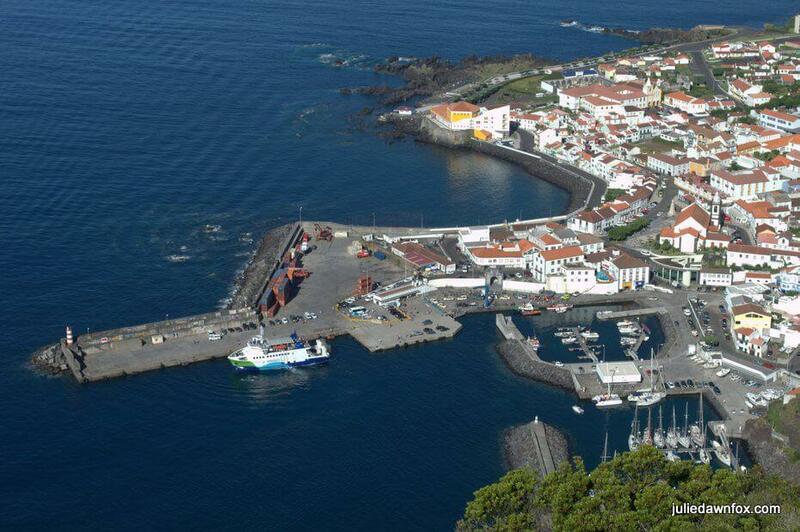 After an experience like that, you might be wondering why my opinion of São Jorge island is still so high. The natural swimming pools were worth every step (although I’d be inclined to drive straight there in future). Aside from the relaxed family-friendly atmosphere, being able to admire the surrounding rock formations and slopes as we floated in clear warm water was a treat. Portugal is renowned for its calçada, the art of creating beautiful patterns using black and white cobblestones. Lisbon and many other cities are full of intricate designs you can walk all over. Velas takes calçada to a new level. The town was destroyed by an earthquake in 1964, the story of which is depicted in a tile panel in one of the squares. The replacement calçada laid during the rebuilding of the town is remarkable. The high street offers scenes of island life while Largo Cons. Dr. João Pereira pays tribute to St. George (São Jorge) and the dragon as well as the parish church. The street running through Jardim da Repbública is also worth a look. Jardim da República is also dominated by a decorative bandstand and bordered by some beautiful architecture. The town’s main square is home to a fantastic dragon sculpted from volcanic rock. I want one! The whalers of São Jorge used to while away their idle hours at the art of scrimshaw, engraved bone. I wasn’t quite sure what to make of this eclectic monument to both the whaling industry and scrimshaw art in Velas. You can lay your towel out on the concrete platforms or swim out to the rocks to laze around. Or pick a table at the café-bar – be warned, they don’t offer much in the way of food. I had to walk back into the centre to find a café that actually had bread and could make us a sandwich to take away! Our accommodation overlooked the harbour, a hive of activity, especially when the ferry arrives. It’s also a place to while away some time observing local fishermen tend to their boats. If you hear weirdly bouncy giggling noises, don’t be alarmed, it’s probably a Cory’s Shearwater bird. São Jorge was the only island in the Azores where we didn’t have a rental car. Having read about the lack of public transport, I had been concerned about how we would get around. A quick visit to the tourist information office on Rua Cons. Dr. José Pereira and we were all set. I am ever so impressed by how organised all of the Azores islands seem to be in terms of leaflets for walks and maps, which are readily available at the airport and other tourist offices. 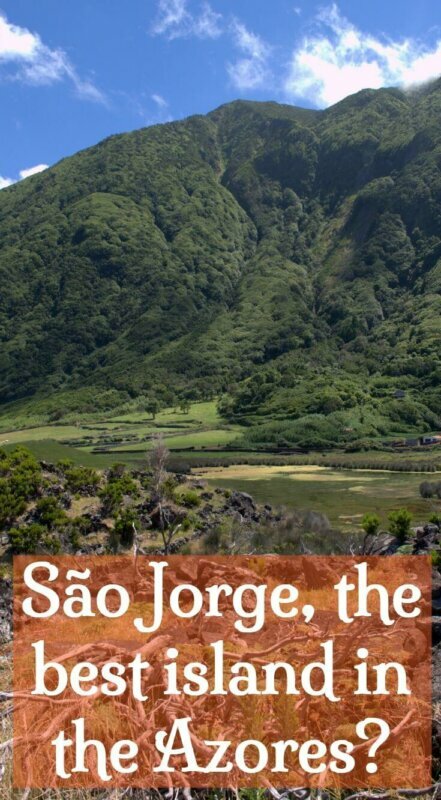 São Jorge is no exception and we came away with a selection of walks, having discussed which ones might be most suitable for our level of ability. The island’s taxi drivers have agreed set fares between them so the very helpful man gave us a list of fares for various destinations on the island including the walking routes. The driver will drop you off at the starting point, stopping at significant viewing spots en route for photo ops. Simply agree a time and he/she will be waiting for you at the end point. You pay when you get back to Velas, or whichever place you’re staying in. If there are 4 of you sharing the cost, it’s cheap and still very reasonable for just two people. We decided to stay in Velas because we were arriving there by ferry and it is the biggest town on the island. Without a car, we wanted to be within walking distance of restaurants. I wouldn’t necessarily recommend the place we stayed in – it was very basic but cheap and well-located. 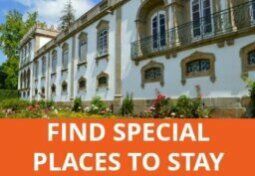 If you want to be in the town itself, Casa do Antonio would be a better option or Hotel São Jorge Garden, which is slightly plusher and has a pool. 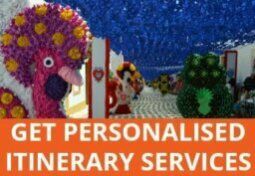 With your own transport, or the help of local taxis, you have more options. Hotel os Moinhos is a charming country hotel with rustic touches, a pretty garden, great views of Pico island, a pool and an onsite restaurant. I agree with your son and partner. You should go! I love the honesty of your R4: Pico do Pedro – Pico da Esperança – Fajã do Ouvidor walk, Julie. Many of us have ‘been there, done that’ e.g in Madeira (twice) for me, but these challenges tend to be the most memorable. I’ve only been to Terceira so will add this to my list of other places to go in the Azores. I know what you mean, Brid. We won’t forget that walk in a hurry, although I had forgotten how lovely the scenery was once we emerged from the clouds.